Hidden sacrifices of various men and women were brought to light in discussion –‘Khak-e-Vatan: A Patriotic Gaatha’held at Albert Hall on Saturday. In conversation were author of the bestselling book, Calling Sehmat (On which the movie Raazi is based), Mr. Harinder Sikka and former Director General Police, Rajasthan, Mr. K.S. Bains. The event was organized by Department of Archaeology and Museums, Government of Rajasthan in association with Rajat Book Corner and Penguin Books. The discussion brought out stories of the unsung heroes of the country who have gone beyond their call of duty and performed valiantly for the nation.Mr. Sikka shared his journey from leaving the Navy in 1993 and going back to the battleground in 1999 during the Kargil war. Telling about the book, Calling Sehmat, he informed that it is the story of a 20 year old Kashmiri girl who was married to a Pakistani army officer by her father for the purpose of espionage. The author urged the audience to read the book as it breaks the stereotype one usually has about Kashmiris being traitors. He also narrated anecdotes about and experiences while making a movie on Guru Nanak — Nanak Shah Fakir. 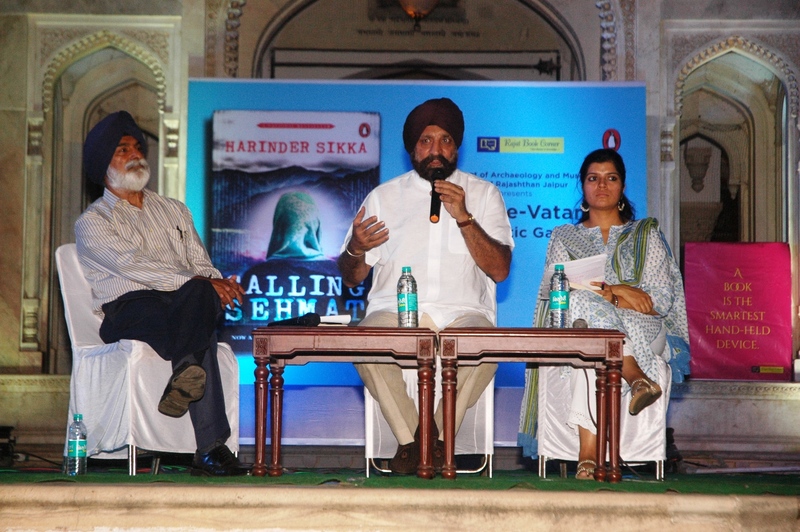 Earlier talking about the book, Mr. KS Bains said that ‘Calling Sehmat’ is a story of nationalism and great sacrifice. It also serves as an inspiration to the youth for serving the country. He further said the recently released movie ‘Raazi’ does not cover two important topics of the book. Firstly, how Sufism and spirituality enabled Sehmat to come to terms with herself towards the end of the story. Secondly, the strong undercurrents of the actions of Indian Navy in 1971 in the book are also ignored in the movie. The conversation was moderated by Aanchal Singh Rathore, who is a lawyer with the Rajasthan High Court and co-founder of the initiative, A Book is the Smartest Hand Held Device. The evening appropriately commenced with the national anthem and concluded with patriotic songs sung by school children. The event was attended by various book lovers, IAS and IPS officers, among others. This event was conducted under the initiative ‘A Book is the Smartest Hand-Held Device’, which is being spear headed by Mohit Batra owner of Rajat Book Corner, and have already hosted three events under the department’s support. This initiative is a platform organised to launch books, conduct speaker sessions and conversations over ‘books’! Started as a passion project, the intent of this initiative is to make citizens move away from the clutches of technology and revel in the comforting world of books and knowledge.